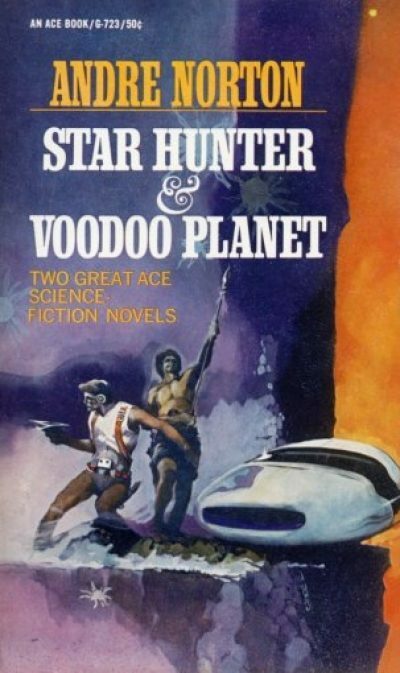 1959’s Voodoo Planet is the second half of the omnibus referenced in the previous review. I was a bit surprised to discover that this is one of the Solar Queen stories. I thought I had been sent all of the Solar Queen stories for review over the years, but I’d never seen this one. Having read it, I suspect I know why this is the Solar Queen tale Norton fans would just as soon pretend does not exist. I will reveal the secret if you follow me into the dark mysteries of a review I will call (borrowing Hradzka’s memorable title) OH ANDRE NORTON NO. Descendents of the survivors of the Second Atomic War! The colony was founded by escaped prisoners—and just one racial stock. They took off from Earth close to the end of the Second Atomic War. That was a race war, remember? Which made it doubly ugly.” Tau’s mouth twisted in disgust. “As if the color of a man’s skin makes any difference in what lies under it! One side in that line-up tried to take over Africa—herded most of the natives into a giant concentration camp and practiced genocide on a grand scale. Then they were cracked themselves, hard and heavy. During the confusion some survivors in the camp staged a revolt, helped by the enemy. They captured an experimental station hidden in the center of the camp and made a break into space in two ships which had been built there. That voyage must have been a nightmare, but they were desperate. Somehow they made it out here to the rim and set down on Khatka without power enough to take off again—and by then most of them were dead. “But we humans, no matter what our race, are a tough breed. The refugees discovered that climatically their new world was not too different from Africa, a lucky chance which might happen only once in a thousand times. So they thrived, the handful who survived. But the white technicians they had kidnapped to run the ships didn’t. For they set up a color bar in reverse. The lighter your skin, the lower you were in the social scale. By that kind of selective breeding the present Khatkans are very dark indeed. Subsequently isolated from galactic culture for long enough to fall into savagery  and then rise back up into a new, unique civilization, the Khatkans were discovered by Survey about seventy-five years ago. Not that any of this has much to do with how the Khatkans interact with the galaxy. The main reason off-worlders visit Khatka is to marvel at the planet’s abundant wildlife. Access to Khatka is controlled by Combine (the least evil of the giant corporations), but they leave local affairs to the locals for the most part. The locals are particularly strict in policing those foolish enough to try poaching on Khatka. You might think the reverse colour bar might play a role in the plot. Perhaps Norton wants to teach us all a lesson about prejudice and can’t we all just get along. If so, this novel doesn’t do anything like that. Unfortunately. As the novel opens, Captain Jellico of the Solar Queen is approached by his Khatkan pen pal Asaki. Asaki convinces Jellico, Tau the medic, and a few other crew members to take a little vacation on Khatkn The friendly reunion is just a cover; the pen pal desperately needs help. Khatka is not only the Planet of Negroes; it is the Planet of Literally Magical Negroes. Someone is using that magic to carry out a program of targeted assassination. Someone wants to change Khatka’s planetary policies and whoever it is trying to do that by killing as many of the planet’s powerful men as it takes to change the survivors’ minds. As it happens, Tau is something of expert on magic; his studies suggest that there are four broad categories of apparent magic: empty superstitions, deliberate fraud, applied psychology, and a poorly understood fourth variety that appears to be real and inexplicable by the sciences of man . Interestingly enough, while Tau wouldn’t call himself a sorcerer, Khatkan sorcerer Lumbrilo pegs Tau as one on sight. The two men immediately dislike each other. Anyone familiar with narrative efficiency in short novels will not be surprised to learn that Lumbrilo is the bad guy in this novel, or least the local bad guy working with off-world villains. It is not clear which of the four varieties of magic would characterize Lumbrilo’s abilities, but the trail of corpses suggests it is not the first . In fairly short order, the investigators find themselves isolated and marooned in the wilderness. Their supplies have been sabotaged and they are surrounded by hungry predators. So, pretty much a normal week for the men of the Solar Queen, albeit a week with a soupçon of something that may very well be genuine magic. However, Norton deploys too damn many racist clichés copied from pulp-era African adventure tales. The Africans may have fled to another world but they are still running safaris for rich tourists. They may be advanced, but that doesn’t play any role in the plot, as we don’t see their cities, only their vast wildernesses. Their otherwise peaceful relationship with Combine (who, to be honest, aren’t really good, just not complete bastards) is disrupted by, oh, lets call them the outside agitators, And of course the main big bad is an evil witch doctor. All in all, while this wasn’t as bad as The Ralestone Luck, it certainly wasn’t good. For some reason, my belief that Norton meant well actually makes the result that much more painful to read. Like Star Hunter, this is available over on Project Gutenberg. 1: Atomic war is bad but you know what’s even worse? Having had enough atomic wars that you can rank them in terms of horribleness. 2: Which, as we know from Norton’s Pax books, is a pretty common pattern for small groups of settlers, regardless of origin. 3: And perhaps a fifth: whole worlds are littered with the relics of civilizations so far advanced past human attainments that their technology might as well be magic. The Solar Queen runs into that sort of thing so frequently that its absence would be worthy of note. Note the lack of such a note. 4: Lumbrilo is willing to use a variety of tools. His magic is partly type two and partly type three, with type four not necessarily ruled out but not proven. He isn’t a conman exploiting the people around him, but a pragmatist true believer. (Like Terran shamans who are willing to practice a few small deceptions because they believe in what they are doing and impressive slight of hand helps the patients trust and heal). Lumbrilo fails in a showdown with Tau because Tau is better at manipulating magical rules in which Lumbrilo actually believes. 5: I don’t believe it would be difficult or time consuming to find 21st century people of supposedly good character who would get very huffy over the idea that mass-murdering Africans is as bad as mass-murdering Europeans. I had one specific example handy, but thought better of it. I don’t want to single out any particular group of people as the epitome of racism; it’s a sadly pervasive trait.